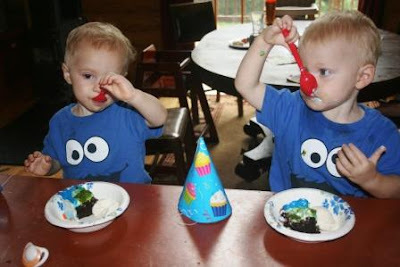 The twins turned two this week. We just do small birthday celebrations, but we always pick out a fun cake. Now the twins like Elmo, so we went to pick out an Elmo cake. A certain older brother had other ideas, though. You can see who won that debate - I figured it was one of those things not worth fighting, since the twins don't truly understand yet. And it was a cute cake! Pierce also picked out a gift for each twin. He picked out Melissa and Doug toys. 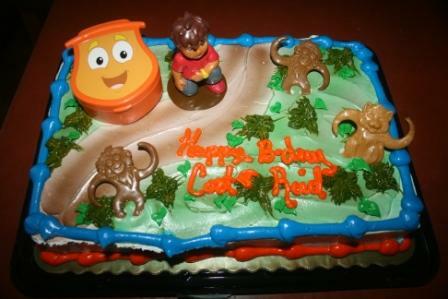 A truck that carries cars for Reid and a birthday cake set for Cort. The twins really loved these. We invited family to come eat Elmo Diego cake and have some burgers. Cousin Grady came and Cort and Reid took him out to show him our baby chicks (post coming soon!). Cousin Grady enjoyed it too. Reid enjoying cake with Great Aunt Pam and Great Uncle George in the background. 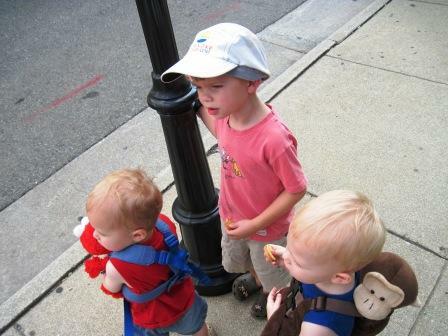 The boys hadn't seen them since Christmas and they were thrilled to have them come for a visit. Pierce in particular really enjoyed spending time with them. For the twins' actual birthday I took them downtown to ride the trolley. It's about a 20 minute ride (and free!) and the boys just loved it. After it was time to head home, I was subjected to a great deal of whining, particularly from Reid, who kept saying "TRUCK! RIDE ON TRUCK!" the whole way home. Going to have to work on learning to say trolley! It was a fun birthday - and the twins are now my favorite age - 2! No lie, I love the terrific 2s! Sounds like the boys had a great birthday! Enjoy the terrific 2's! I loved two too. 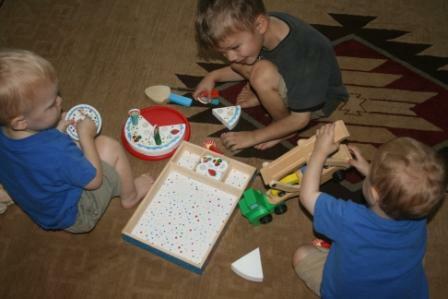 Pierce chose a really cute cake and presents for his brothers. The trolley looks like so much fun. Looks like a special birthday celebration. 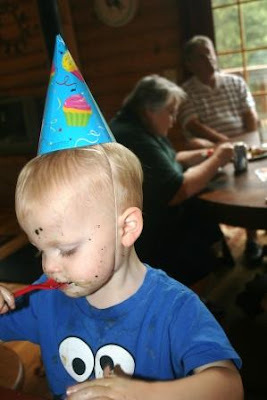 We always did simple parties for my son's birthday too. I can imagine how much fun that trolley ride was! And free?? How could you go wrong? Chicks! Looking forward to more pics of them. Looks like the twins had a good birthday. THe cake is my favorite part of a birthday celebration,this one is cute! oh, happy birthday to your two twos!!! so cute! Happy Birthday, boys! :) Big brother Pierce picked out a fun (and tasty looking) cake! Looks like a great day for all the boys! oh they are just adorable!! happy birthday!! enjoy, it goes so fast, my babies are 9 :/ i miss those 2's! I think Elmo has had his fair share of attention. Good on Diego. Happy birthday to your adorable twins! Pierce did a great job helping with the celebration. The trolley ride looks like a lot of fun. Two IS adorable!!! They say and do the cutest things! I knew that was a Diego cake when I first saw it. Dora and Diego are very big in our house, we have lots of Dora, even the talking backpack. 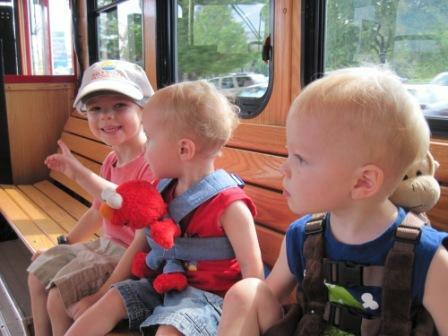 Looks like everyone had such fun, but the most fun for the boys was the trolley ride! Remember Mr. Rodgers and the trolley? Happy Birthday to Cort and Reid! 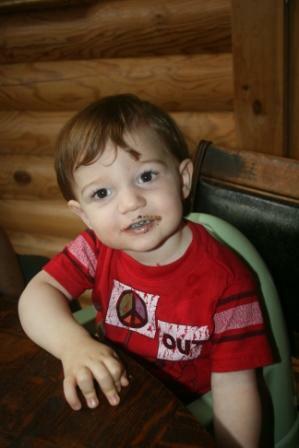 I think that was a really wise decision to let Pierce chose the cake. He did agreat job choosing it and the gifts. Looks like it was a sucess all around! The 2's are fun and exhausting both but so cute! I think the cake is geat! We like to do small birthdays too. What a great Birthday they had!!! I love that big brother picked something out for each one. I let my girls do that too. Definitely great to teach them about giving. 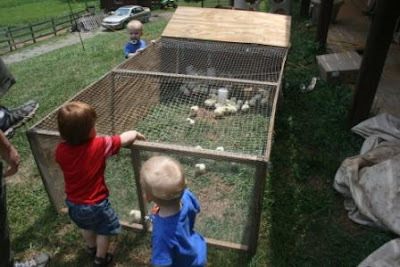 Your baby chicks are oooohhh soooo cute! Happy birthday to your sweet boys. Well you are very blessed with two that they are so terrific! I think I would like Pierce to come plan my next birthday! I love the picture of the two cookie monsters eating cake. And, I love the terrific twos also. Happy Birthday to the two little Leos. The trolley is such a fun idea and free is great too. The two's are wonderful, and go by way too fast. They are so cute! Happy Birthday, boys!